One of the main reasons many people want a water garden in the first place is so they can have fish. Fish make the whole scene come alive! Care of pond fish is very similar to caring for aquarium fish, except you have to deal with the issues related to keeping fish outdoors. You have plenty to discover about the selection and care of pond fish. Get help and information from wherever fish are sold. Two types of fish are commonly kept in water gardens: Common goldfish and koi, or Japanese carp. For common goldfish, keep 1 inch of fish per 5 gallons of water. Koi, because they're so big, need a bigger pond and a rate of linch per 10 gallons of water (and ones over 6 inches require even more space to roam). See Figure 17-6. For advice on helping your fish survive the winter, see "Winterizing your plants and fish." 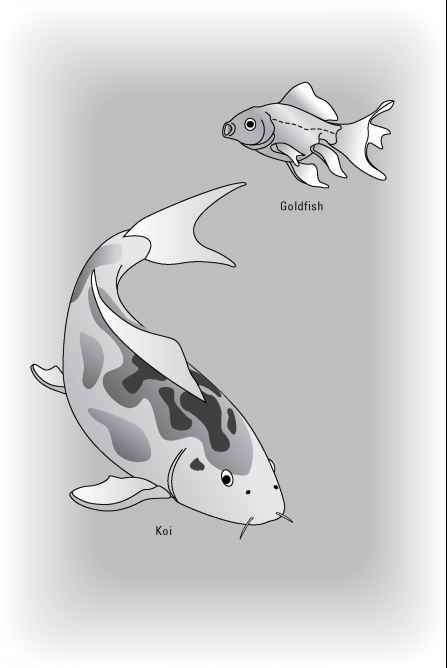 For more information on keeping koi, read Koi For Dummies. Koi can be very destructive to plants. They like to eat 'em! 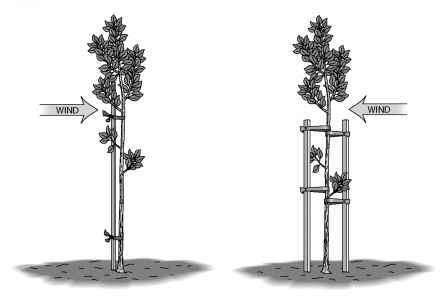 So protect your plant roots or, better yet, stick with goldfish that cause much less plant havoc. Adding game fish is only practical with large ponds, a half acre in size or more. Those kinds of ponds are beyond the scope of this book. Native fish can be stocked, but most people opt for ornamental, cold-loving fish like goldfish. Most garden centers and pet stores stock fish that are appropriate for ornamental ponds. ^jfftNG/ A common beginner's mistake is adding too many fish in a pond; it's bad for the fish and bad for your water garden. Results of overcrowding include excessive fish waste (which can smell bad and fuel algal blooms — check out "A sea of green: Controlling algae in troubled waters") and poor fish health — ick. Be conservative and don't add many fish, especially to smaller water gardens and container displays. Koi (bottom) and ornamental goldfish (top). Don't use chlorine or chloramines! If you filled your water garden with municipal tap water, it's been treated with either or both of these chemicals. Although these chemicals kill bacteria and make for safe drinking water, it's harmful to fish. Luckily, if you let the water sit for a few days, the chlorine will dissipate; as for chloramines, they have to be neutralized — ask your water department for help. Let the water warm up before adding fish. Allow the water to warm while you're waiting for water-treatment chemicals to subside. The fish will appreciate that (hose water is chilly). A well planted pond will provide lots of hiding places to protect your fish from predators. Also, to keep predators like raccoons and herons out, the edge of the pond should abruptly fall off by 2 to 3 feet so these creatures can't wade into get the fish. Also, some people buy heron decoys to put at the edge of the pond to frighten off other predators. ^ Add the fish gradually. Fish are cold-blooded, and they need time to adjust to the temperature of their new environment. The best method is to float them in the water-filled baggie they came in on the surface for a few hours; then release them. Don't overfeed your fish! The general rule is that however much food they consume in 5 minutes is all they get. Uneaten food fouls the water. Overfed fish are unhealthy and also generate too much waste. Truth is, you really don't have to feed your fish at all. They can survive on the natural foods in the water. But it is fun to feed the fish, so if you want to, do it sparingly. Once a day is plenty.